Outdoor lighting is an important feature of your home. Not only does it provide safety, but it can also highlight the beauty of your home and landscaping. A comprehensive and unique outdoor lighting system also adds home value. There are several different techniques you can use to improve the safety and attractiveness of your home. Walkways, stairs, decks, patios, and driveways should all be well lit at night to prevent falls. Lighting along the hardscape to project onto the pathway is common for walkways and driveways. You can also get lighting to shine down from above. This type of lighting offers the most security against intruders or trespassers. A well-lit home is less of a target for crime. Spotlighting offers additional security by lighting up the front of your home. Spotlighting is also a beautiful addition. A spotlight is placed either from below pointed up and in toward the house, or it is placed from above. Done correctly, it will enhance the most unique aspects of your home, making them stand out in splendor. If you really want to increase the safety of your home, you can install security lighting. 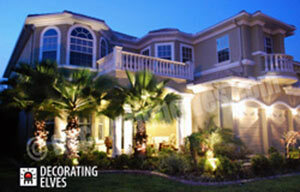 These are accent lights placed throughout your property and installed with low level lights. This allows for the security of a well-lit area, but without blinding you or your security cameras. Security lighting can be installed in such a way that it is both a safety measure and an addition to the beauty of your home. Adding outdoor landscape lighting to your property will increase its value. It should be viewed as an investment. If you ever decide to sell, the outdoor lighting will increase the curb appeal of the property, help it sell faster, and help it sell for a higher price.